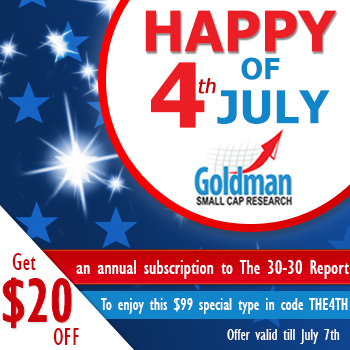 Happy Independence Day from the team at Goldman Small Cap Research. We have some good news and some bad news. The bad news is that you are not currently a subscriber to our premium small cap stock picking newsletter The 30-30 Report. The good news is that in honor of Independence Day we are offering you the opportunity to subscribe for just $99. That is a $20 savings! In the past couple of issues we have had one stock hit the 30% mark in a matter of weeks and two others just fall a percentage point or two shy. The Dow just hit a record 17,000 and small caps are already off to a great start this month. Don't miss out on potential new winners. This offer is only good until July 7th and our next issue will be published around the corner, on July 16th.